“It was so warm we had to take our pullovers off on the golf course.” This statement was made to me today by an Aboyne resident who had been enjoying the full benefit of a record temperature for February on Deeside. Oh, yes, Deeside is the place to be in February. Despite the unusually high temperatures, the southeast of England could have frost over the weekend where the skies are clear. This is no more than people living in the southeast of England deserve. You can’t be too careful these days, so I should make clear that is intended as a wry, mildly humorous statement, not intended to offend those members of my wife’s family who live there. You can also see from the article that temperatures last peaked at this dizzying level for February back in 1897. I thought, therefore, it might be interesting to have a look at what else of historical interest was happening in 1897. I leave it to you to spot the similarities with the 21st century. • Benin (Nigeria) is put to the torch by the British Army’s Benin Expedition. and the Benin Bronzes are carried back to London. So, this week adolescents have featured large in our news headlines. And please notice the “So” which is so necessary when beginning statements made by adolescents and post-adolescents and is a linguistic tic that so makes me want to scream. So, yes, adolescents. So, what have they been up to? Well, Shamima Begum, for a start. She is a British ISIS bride who, “heavily pregnant”, wants to return to the UK, having absconded in 2015 to join the so-called caliphate in the Middle East. She wants to come back so that her child can be brought up here. One third of me says, under my breath, “Brought it on yourself, dear”; another third wonders what kind of hell it is to be heavily pregnant, aged nineteen, living in an overcrowded, stinking refugee camp – and, yes, I know she claims to have been unfazed by seeing severed heads; while the final third feels for her parents. Having spent a significant part of my career surrounded by adolescents – in loco parentis, I hasten to add – I have yet to meet a parent who does not continue to love their child regardless of the foolish things they may have done, the exasperatingly stupid scrapes they may have got themselves in to, even the criminal offences they may have committed. I fear there are no easy or happy answers in Shamima’s case. Greta Thunberg is everywhere, appearing at Davos, giving a TED talk, speaking at the UN Climate Conference in Katowice, and her message is always the same. Western governments are doing nothing to combat climate change. Now, I admire Toby Young, who has done a great deal to challenge (constructively) the educational status quo in England. I have even publicly defended him in a letter to the Times, but on this, Toby, you need to cool, man. Subtlety tends not to be in the nature of the adolescent. It is all or nothing. Here sixteen-year old Greta is talking – not in her native language, mind you – but talking nevertheless with passion about a matter of global significance. Yes, she may have overstated and exaggerated, but that is what sixteen-year olds do. Some of her followers in this country are equally passionate, some probably just fancied an afternoon off. How was your behaviour when you were sixteen, Toby? Maybe so, but I bet that for every teacher who had to rearrange their lesson about Boyle’s Law or reschedule that stunning presentation about the past perfect tense in French reflexive verbs, there were ten who privately sighed with relief that they didn’t have that restless bunch of terminally bored, hormonal adolescents to manage during all of Friday afternoon. And remember, those teachers and their pupils will be back in their classes in a day or two and the next day and the next day and the next day. I just SO want you to lose that SO. 2. To recover physically from the injuries inflicted during 2018 – notably the fall and broken arm last August, which put paid to driving a car and walking with Archie for a number of weeks. By making these resolutions public, I hope to stick to them and to bore readers of this blog with regular progress reports. Ice on Deeside is making life treacherous for some of us at the moment and I am determined not to hit the ground again this year. Exercise, therefore, must needs be taken inside. At home I have an exercise bike which proudly the displays the logo “Body Sculpture”. Well, we can all dream of that Michelangelo-type figure, which, as luck would have it, is not unlike my own. As the original of David is readily available on the internet, I don’t need to prove that statement by displaying my personal replica of that magnificence. Here’s what Michelangelo created, so all you need do is simply re-imagine that figure as a Scotsman with a beard. Stroke survivors, and possibly many others, will recognise the feeling of wobbly legs and total physical exhaustion associated with exercise bikes – and that’s while getting on the bike, let alone the feeling after 5 or 10 minutes hard exercise and then getting off it again. I am assured by physiotherapists that regularly punishing myself in this way will build up strength and stamina. Because I am an optimist I choose to believe them, although after running through Program 1 for the first time, I was in no fit state to do anything other than collapse and gasp for water. After 20 minutes of seemingly endless pedalling I had negotiated the slopes and allegedly covered a distance of 6.8 kilometres. A few days in, and I have broken the 7 km barrier, and today clocked up 7.15 km. Perhaps the physios are right after all. The trouble is, this biking on a static bike going nowhere is boring, boring, b-o-r-i-n-g. The devil on my shoulder says “Don’t bother, son.” So either I have to get music, a radio or a personal trainer to keep my interest, or I have to make public the fact that I’m doing it – hence this post. One of the buzzwords in health care at the moment is self-management. This is the theory that people with long-term conditions, like stroke, can learn to self-manage their condition. Personally, I need that self-management to be supported self-management, because otherwise the will is lacking. In the absence of a personal trainer to provide that support, I ask you, dear reader, to provide that support by making it your resolution to follow this blog through the ups and downs of 2019 – just don’t set your resistance to level 9. Finally, you may care to read my article about the current state of stroke care in Scotland in this week’s Scottish Review. A happy new year to all followers of this blog and all good wishes for 2019. May all your troubles be small ones, and may those who care for you be generous and kind and fill your bowl with happiness. And biscuits. Followers of this blog may have noticed that there has been a long silence since the summer, when I wrote about the joy that is the annual stroke care audit in Scotland. Blessed relief? Serious illness? Death? Nothing so dramatic. Sometimes, your blog has to fall silent, you have to laugh, nurse your wounds and simply be grateful for your fellow man and woman. On a pleasant day in mid-August, Johanna, Archie and I were walking through the Bell Wood near Aboyne on Deeside. Cheerful chatter and clashing opinions ricocheted snappily between Johanna and me. Archie, meanwhile, was displaying his usual mix of obstinacy, disobedience and whippety charm. Our walk was almost over when a tree root, a stone, my foot or part of the dog jumped up and caused me to fall flat on my face. I lay floundering on the ground, unable to get up because of shooting pain in my left arm, and Johanna was unable to hoist me to my feet. After a few moments, a young woman came along, pushing her baby in a pram. She was accompanied by a little black dog. 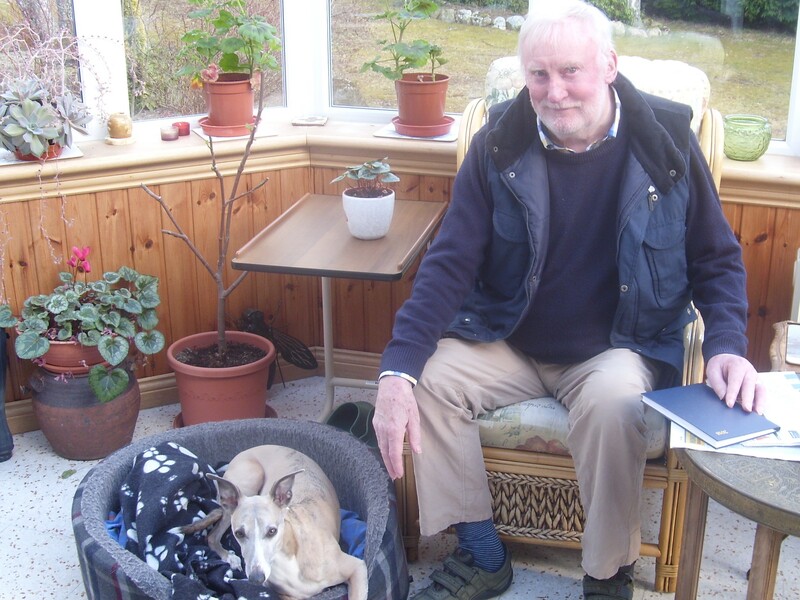 As Archie and her dog made friends and began to lick each other and me, she revealed that she also had a mobile phone, that her father was an off-duty paramedic, that he lived a short distance away and that she would give him a call. The baby grizzled slightly. Reader, I will spare you the details, but within a few minutes the baby had cheered up and that woman’s father had me on my feet, marched out of the Bell Wood and ordered to report to Aboyne hospital forthwith. His name is Derek Grant, and Johanna and I are eternally grateful for his kindness. At the hospital, I was quickly x-rayed, strapped up by friendly staff, offered painkillers and given a video call to the emergency department in Aberdeen. The consultant there diagnosed a broken humerus, offered reassurance, practical advice and told me to be patient. Within a short time, that tweet had been re-tweeted and had acquired more than a dozen ”likes”. If that sentence means nothing to you, then you are an innocent in the world of social media – and probably the happier for it. You will have to take my word that those reactions mean people appreciated the sentiments behind what I had said. You will notice that, in extending my gratitude, I copied in NHS Grampian and our local health and social care partnership. For the last four years, I have been a non-executive member on the Board of NHS Grampian. It has been an interesting and challenging time, particularly as it has coincided with ambitious plans nationally to integrate health and social care. The system is not perfect – far from it. But it has been a privilege to see the commitment, energy and sheer hard work of our health and social care staff at all levels across the north-east of Scotland. It has also been fascinating to be involved in the strategic thinking that has to go on behind the scenes to make our health and social care services function at all in the cash-strapped environment in which they currently operate. On that day in August, having just returned from a meeting about strategic plans for health care in Grampian, I was brought down to earth – literally – and experienced the system at the sharp end. I was lucky to break my arm at the very time when a paramedic’s daughter happened to be walking in the same wood; when the x-ray service in Aboyne hospital was fully manned; when a consultant was available to see me via video link from Aberdeen. A few days later an occupational therapist arrived with a shower chair and a lever to help me get out of bed in the morning. I have since received excellent physiotherapy and hydrotherapy for general strengthening. When the system works well, like this, it is great for patients. I am fully aware that it is not always so, but one constant that is always there is the willing professionalism of the people who work at the heart of it. By comparison with many parts of the world, we are lucky to have an effective health and social care system at all. Having been silent on this blog for so long while recovering, I have had time to reflect on the four years I have spent as a very small cog in the complex machine that is the NHS in Scotland. I fear that followers of this blog may be subjected to a regurgitation of some of those thoughts in 2019 – you may care to look away now. Apologies for the length of this post. As I do every year, I am providing a link on this blog to the annual Scottish stroke care audit – now called the Scottish Stroke Improvement Programme or SSIP as we shall learn to call it in the densely populated world of NHS acronyms. Those followers of this blog with long memories will quickly realise that the cover (illustrated) has changed little from last year. The same smiling therapist and the same smiling patient are there. I wonder if the patient has progressed significantly since last year; I wonder if the therapist is now a member of a fully integrated multi-disciplinary team helping to provide continued rehabilitation for stroke survivors after they have left acute care. I wonder. I wonder. At least they are both still smiling. Only the date has changed – 2017 has moved inexorably on, as it does, to 2018. So, has the content changed? Yes, the layout has changed, once again, but maybe not the underlying message, which is – acute stroke care: probably improving slowly, though not all good, and regressing in places; stroke rehabilitation – measured patchily and wildly different across the country. There is an introduction from the Chief Medical Officer for Scotland, Dr Catherine Calderwood, a woman for whom I have the highest regard, mainly because she has articulated elsewhere a clear vision for health care. Dr Calderwood, as you would expect, uses the word “improvement” on a significant number of occasions throughout her introductory letter, whose message is largely directed towards clinicians and other healthcare professionals. The target is 80%. You decide how significant an improvement that is, bearing in mind there are real people at the sharp end of this statistic. Would such a record in terms of punctuality be acceptable on our rail network, for example? This tortured sentence is challenging to understand and includes “going forward”, that ugly 21st century phrase suggesting an optimistic but vague future towards which we are all moving and in which everything will be brighter and better. That is not quite the picture of stroke rehabilitation that the SSIP paints. More of this later. Having been privileged to see some of these people at work, I’d be tempted to replace the word “sometimes” with “almost always”. “Progress towards the standards of care” – an acknowledgement that we are not yet reaching the standards we aspire to. This failure is much evidenced in the report. And what about “unwarranted variation” – an Orwellian understatement and the hallmark of post-acute stroke care across Scotland. In simple human terms, if you leave hospital alive after a stroke, the care you will get is a healthcare lottery depending on where you happen to live. I have spent a lot of this post describing Dr Calderwood’s introductory letter, for which I make no apology as it sums up some key points in the audit. Her underlying message, while trying not to discourage the troops, is that things must improve. They must. We are pleased to note the improvements outlined in the audit, but some serious challenges remain. Most notably, we are disappointed to see a significant number of hospitals not performing well against the standard set for delivering thrombolysis**. The earlier a clot is dissolved with thrombolysis which unblocks an artery and allows blood to flow through the brain, the less disability will be experienced. We are also extremely concerned about the delivery of thrombectomy***. In 2017, only 13 people received thrombectomy, and currently no centre in Scotland is providing it. The Audit identifies around 600 Scots per year as potentially benefiting from this life changing treatment. A national committee has been established to plan a Scottish thrombectomy service, but the process is slow and the consequence again is that many patients have been left with worse outcomes and significant disability. We are calling alongside Chest, Heart and Stroke Scotland for the provision of thrombectomy in Scotland to be tackled as a priority by the Scottish Government, with national funding identified by the NHS. Those eligible stroke patients in Scotland deserve the same access to this life-changing treatment as in England. 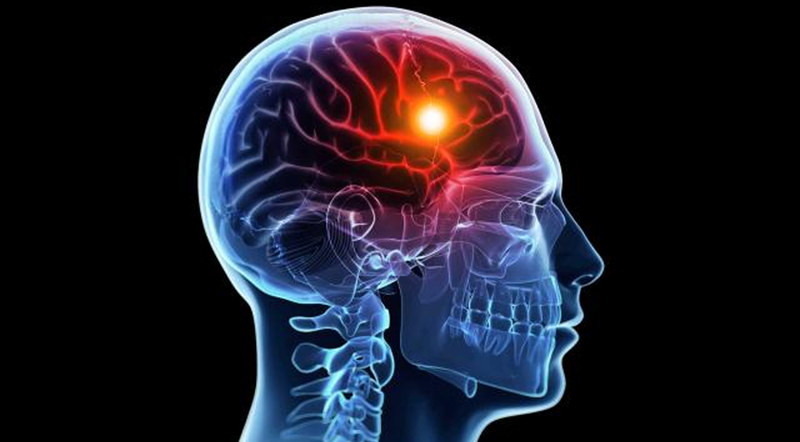 In the developed world many areas have developed Comprehensive Stroke Centres (centres that deliver all aspects of stroke care, including stroke thrombectomy). Currently there are no Comprehensive Stroke Centres in Scotland. Stroke is a medical emergency demanding as much urgency as, say, a heart attack. The type of stroke must be quickly ascertained and the correct subsequent procedures followed. As the report admits, hundreds of people who survive a stroke could have had a better quality of life (note the verb tense – “could have had”). In other words they could have had less disability, could have had less demands on their families, could have had less need of expensive personal care and overall could have had a better quality of life if thrombolysis targets had been met and thrombectomy had been available, for those for whom it was suitable. They are the lost opportunities – the could have hads – a silent shambling army, with damaged brains and weakened bodies, but wistful thoughts of what might have been. Nothing worthwhile is ever achieved easily, as any stroke survivor will tell you. I may be howling at the moon, but I urge Jeane Freeman, our new Cabinet Secretary for Health, not just to make stroke care a priority, but to make Scotland a world leader in stroke care. That would be a great legacy for her, but, more importantly, it is no less than stroke survivors and their families deserve. Congratulations England. You had the stronger team today, and a great goalkeeper. When I have digested the result, I will support Three Lions. If you are reading this at some point in the future, and not the torrid present, you may remember that yesterday (7 July 2018) England beat Sweden 2-0 in the quarter finals of the World Cup. You should also remember that I am a Scot writing a blog in the heart of Scotland. These days sending such bland but positive comments about anything English out into the Twittersphere is to invite abuse from the small but unrelenting band of Scottish nationalists out there who will respond with foaming-at-the mouth abuse in reply just as quickly as their sweaty fingers can scuttle over the keyboard. Hell would have to freeze over before I supported Englandshire in even a game of Tiddliwinks! I’m Scottish, never British! Much worse will follow that factually incorrect statement, I am sure. It is important not to take this stuff too seriously. In the past (by which I mean before the ascendancy of the current domineering Scottish political class) it was possible to indulge in good humoured banter about the relative merits of Scottish and English sport without anyone getting worked up into a steamy, boiling nationalistic frenzy. Nowadays it’s a minefield where unwary comments about the Scotland team, the England team or the UK constitution can destroy friendships and families. I say “UK constitution” but what I mean, of course, is “Scottish independence”. I have learned over time that the best way to defuse the aggressive nationalist mine is to beat their explosive into the ploughshare of humour, if at all possible. Anyway, for what it’s worth my very amateur view of yesterday’s game is that both teams played well, but England defended particularly well, played as a mutually supportive team and played with obvious passion. Above all, there appeared to be no prima donnas on either side. I suppose I am privileged in a way. The experience of waking up paralysed and alone in a Norwegian hotel, not knowing whether you are going to live or die, helps you to understand what are the important things in life. So, I know that, at the end of the day, none of the above matters – not the football, not the social media sniping, not the bitterness of some politicians, not Harry Kane’s hairstyle or even Gareth Southgate’s waistcoat. What matters – at a personal, national or international level – are family and friends, and sustaining and supporting good relationships between and among them. That is something I boringly try to remember every time I find myself lurching towards the caricature of a GOF. So what’s the issue with our Scottish politicians – an excess of heat? too much hot air? or not enough of a sense of humour? In the mid 1970s, I spent a year working as a lecturer at the Federal Advanced Teachers’ College in Okene, Nigeria. I say “working”, but in fact the College had not actually been built due to a significant dispute about land. Despite this, some students and a substantial complement of staff had been recruited from Nigeria, the UK and a number of other countries The college was temporarily housed in what had previously been an army barracks. I posted about this experience on this blog some time ago – see The Yellow Typewriter. My abiding memory of that year is frustration – closely followed by heat, heat, heat and a fairly significant lack of water. The staff and students involved were also larger than life – but that is another story. If you look at a map, you will discover Okene to be situated approximately 40 miles east of the confluence of the Niger and Benue rivers. It is in Kwara state, which due to its position in the centre of Nigeria “benefits” from a mix of the enervating humidity of the south and the intense heat of the north. The net effect of this is that day to day in the dry season (roughly October to March) there is hardly any rain but plenty of humidity, and even in the wet season (roughly May to September) the rain is heavy but only intermittent and the air is intensely humid. Day after day in the dry season we would pray for rain and watch as promising thunderclouds built up or rolled past like black smoke over nearby hills. Only rarely did they cool things down with refreshing rain. I have never since taken for granted a supply of clean water. While admittedly on a different scale, I have been reminded of those days in recent weeks, as here on Deeside, and specifically in Aboyne, we have had day after day of hot weather and our garden has become baked dry. In the afternoons, dramatic cumulus clouds have built up, promising storms, only to disperse and vanish. 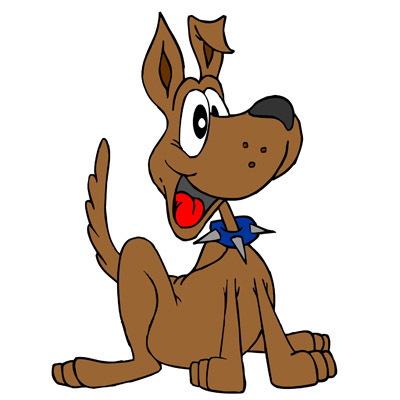 As I type this, there is not a cloud in the sky, our dog lies panting on his bed and it is too hot (at least for a fair-skinned Scot) to sit out for long in the sun. It is all relative, of course. Last week, I was in Edinburgh for a Stroke Association meeting, where, thanks to the fine weather, I was sufficiently encouraged to walk from my budget hotel to the Stroke Association office. As followers of this blog will know from a previous post, this was always going to be something of a challenge. My legs had scarcely recovered by the next day, when we had a family reunion in Edinburgh with the visiting American kin, including Cambria. If that statement makes no particular sense to you, then I encourage you to read an earlier post on this blog, The Wicker Basket . For these kin from the USA, our Scottish “heat” was, of course, nothing special. Try telling that to the spaced out, panting whippet lying next to me. I cannot decide whether or not I am a dog lover. This is the sort of problem that I have the inclination to mull over now that I work only part-time. Here I am with my dog, apparently relaxing at home. Note the dog’s stare. Note how joyful I look. Note the shrivelled leafless plant in its pot. By the way, I say “apparently”, because I mean “apparently”. 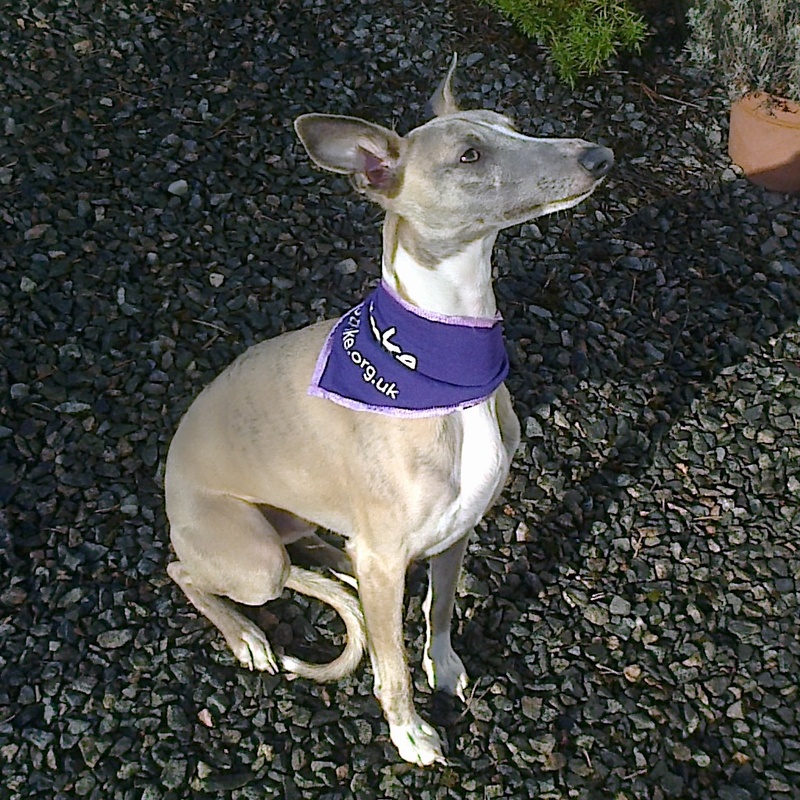 As regular readers of this blog know, we were acquired by a whippet some four years ago. Archie is the successor to our much loved literary whippet, Hamish, who died at the ripe old age of fourteen. Hamish was easy going and laid back. Archie is different. This sums up well the relationship we have with Archie. In this picture you can see it all. The soulful eyes, the pleading expression, the silent re quest “More, more, more” – the “more” could refer to food, games, ball throwing, walks, love; in fact, any of the many exhausting pleasures enjoyed by a dog. Not all readers of this blog are dog lovers. I understand that. For many years I myself resisted being owned by a dog and, as I say, I am still not sure if I fall into the category of dog lover. This is partly because our dog’s day consists of a constant psychological war of attrition with his humans. Whippets rarely bark, so he uses a combination of the unnerving whippet stare, his compulsion to live to a strict routine and his unending state of canine adolescence to ensure that he has full control over his human servants. This is his typical day. Early morning: At the same hour each day, Archie expects to hear the rattle of breakfast dropping into his bowl. After he has eaten it and while his humans are trying to enjoy their own breakfast, Archie wanders around aimlessly, anticipating his morning walk, occasionally staring hard and reproachfully at his humans. If the walk is delayed slightly, he drops balls on the floor and squeaks his toys repetitively. If the walk is delayed excessively, he whimpers pathetically and stands in the hallway staring dismally at the front door. Morning: Archie has a walk with one of his humans. This is an opportunity for him to sniff things, meet other dogs, disobey commands, scavenge detritus from the forest floor or pick up bits of stale sandwich and other carelessly dropped human food. If the sun is shining on his return home, he expects to find a bed laid out for him in the garden. If this is not done, he cultivates a mournful expression, stares hard and accusingly at his humans, whimpers or squeaks his toys repetitively once more. Mid-morning: Archie greets the postman who, long since defeated by the whippet stare, drops a biscuit into his gaping jaw. Afternoon: Archie must have another walk with one or both of his humans (see “Early Morning” above). On his return home he trots straight to the kitchen and stares mournfully at his bowl until the crunchy rattle of dog food announces the arrival of his tea. After he has eaten his tea, Archie joins his humans and stares reproachfully at them to ensure that they do not spend too long drinking their tea. This behaviour, with its accompanying whines and whimpers, is an indicator that it is time for his biscuit, followed by some ball throwing and a chew. Evening: Archie takes his ease in one of his beds, practises his various mournful expressions, mulls over his day and contemplates ways in which he can continue to keep his humans on a tight rein, while disobeying their every command. Look again at that first photograph. Look at Archie’s stare. You should now be able to understand that we are only “apparently” relaxing. Am I a dog lover? You decide. First link. As promised, a follow-up to my previous post. Second link. 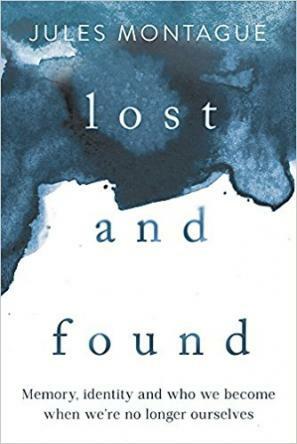 I can recommend Lost and Found , a recently published book by Dr Jules Montague, a neurologist from London with whom I shared a discussion on Radio Scotland yesterday. For those of us with an interest in all things brain – at least from a lay perspective – this is a fascinating read. The book explores identity and its loss through a series of stories about individuals whose memories and identity have been changed by brain injury, stroke or dementia. As readers of this blog will know, this echoes my own question following stroke – are the pre-stroke Eric and the post-stroke Eric the same person? I still do not know the answer to that question, or even if it is the right question, but thought has been provoked and further questions posed in my own mind by reading this book and having that discussion yesterday. I have heard of stroke patients being told “You will never walk again”. In my own case I was sent home from hospital in a wheel chair after four months and it was strongly hinted that this and the splint attached to my left leg would for ever more be features of my life. I will never forget being told by a stroke nurse, after leaving hospital that my ambition should be limited to a nearby stroke club where I could “play dominoes”. Similarly, I will always be grateful to the independent physiotherapist who refused to accept things as they were and worked with me to improve my balance and walking. I will never be a Strictly* star, but then my partners in my previous life were never particularly flattering about my efforts on the dance floor, and probably still remember the bruised toes. Jules Montague’s book may pose more questions than it answers, though for me it answers some, simply by offering reassurance that I am not weird for wondering about these things. Underpinning all the stories in the book, and all the clinical causes behind some of them, is the profound mystery that is the brain and the fact that in 2018 we still do not fully understand the complex inter-relations between brain, mind, memory and identity, which is why, in my view, no stroke patient should ever be offered a statement beginning with the words “You will never….” Neuroplasticity and the infinite complexities of the brain may make many things possible. Third link. Since I am determined to finish on an upbeat note, here is a link to the inspirational website of Debra Meyerson, a former Stanford University professor, who is co-writing a book called Identity Theft about her personal experience of stroke, post-stroke identity and recovery. The final link is to that BBC Radio Scotland programme I mentioned at the beginning of this blog. The programme will be first broadcast at 13.30 on Monday 19 March. It is called Personal Best. Thereafter available on BBC i-player, it is hosted by Gillian Russell. You will hear Jules talking sense and me rambling. *Strictly – For non-UK readers, Strictly Come Dancing is a BBC television programme in which celebrities pair up with professional dancers in a weekly extravaganza of exotic dress, sequins and general brightly-coloured musical jollity.